Get 30% Off on custom yard signs today! Offer ends May 1st. 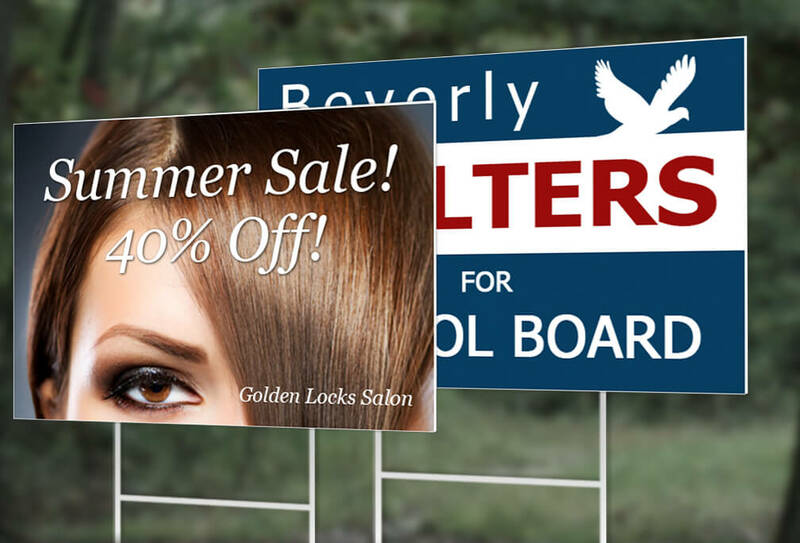 Weather resistant yard signs perfect for local promotion. Our signs print with vibrant colors and photo accuracy. Christian in NM said... This is my fourth yard sign that I have gotten from PosterBurner to put out in front of my restaurant and I've been pleased each time with the professional job. M. Wall in Minneapolis said... I got a lawn sign for my wife's birthday party and it looked good. Vinny. in GA said... I made a no soliciting yard sign at PosterBurner and it has worked great. Anna K. in OR said... I wouldn't go anywhere else to get a custom yard sign made. PosterBurner does it right. Chris P. in Toronto said... I just received my birthday yard signs in the mail and boy do they look great! So happy with them. Artificial Intelligence based image upscaling. We use a Convolutional Nueral Network to maintain image sharpness on even the smallest images. No one else can print small images so clearly. Our results are superior to every other method of image enlargement. Super resolution drastically reduces pixelation. Our super resolution process smartly breaks down pixelated areas to make them sharp. We use solid gaterboard backing. Our yard signs are backed by solid 1/4th inch gator board for added durability. We use professional Epson Solvent printers. Instead of printing on the gator board, which is a low quality print, we print to a decal and apply it seamlessly. Add a Yard Stake. You have the option to add a yard stake for easy display. Yard Signs help local promotion. 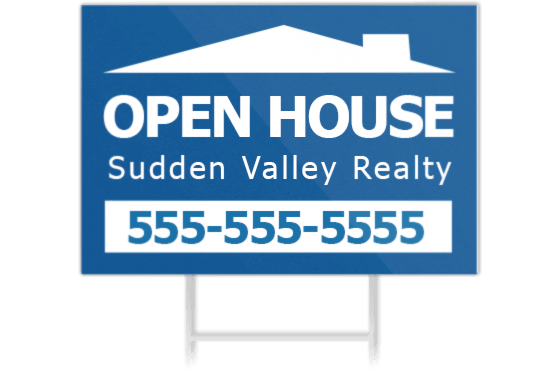 Yard Signs can be the cheapest way to get the word out locally about your business or place for sale. Our satisfaction guaranteed policy means if your order is mishandled or damaged in any way during shipping we will replace your print for free. Please complete the following steps to return your damaged print and get your free replacement sent out immediately. Create your custom yard sign in less than 5 minutes. Step 1: Upload Your Image Upload a single image or an unlimited number of photos to make your yard sign. All files are accepted. Including .jpg, .png, .pdf, .psd, .doc, .tiff, .ai, and more. 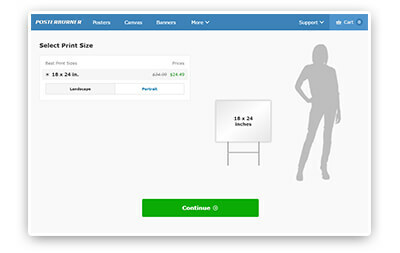 Step 2: Select Your Print Size Select from available print sizes, choose your quantity, and get a visualization of the actual size of your yard sign. Step 3: Customize Your Yard Sign Turn your custom yard sign into a collage by uploading additional images. Templates are available for popular sign designs such as birthday yard signs, yard sale signs, and for sale yard signs. 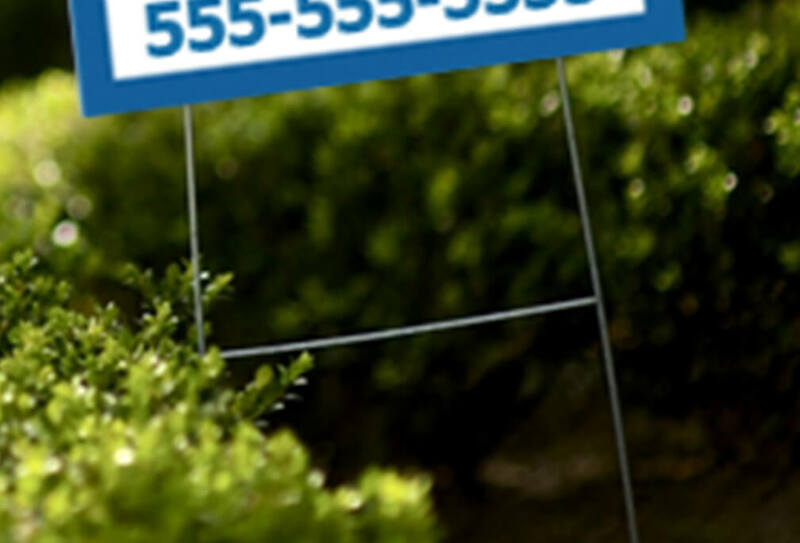 Custom yard signs typically print and ship within 3-4 business days. The shipping service selected determines the delivery date. What file quality do I need? Almost any image will work on a yard sign. We accept all file types, including jpeg gif png tiff psd ai doc ppt zip xls and many more! How long until my yard sign arrives? Yard sign are typically printed and shipped within 2-3 business days. We use high quality all-weather materials and premium ink that provides exceptional image quality and durability when we turn your pictures to a custom yard sign. Learn how we take the image size and quality and combine that with the image subject to determine the optimal printing size of any image. If you want to make posters from pictures (or canvas, banners, decals) then this guide will help you determine how large you can go with your image. This blog post covers popular methods for hanging a custom banner print. From banners with grommets to banners with pole pockets, this article has you covered for display options. Learn how to hang a custom poster. We review a variety of hanging approaches and resources to hang your custom poster print.